Spring is in full bloom. The welcome sunshine is producing a rainbow of flowers in my yard and filling the produce aisle of the supermarket with irresistible sweet, red strawberries. Strawberry season announces that winter is officially over and lemonade weather is around the corner. Soft and fruity Strawberry Lemonade Bars are bursting with these warm weather flavors. When I was a child, I was allergic to chocolate, so strawberry was often my default flavor. Like many things in life, the forbidden have the most allure. I would secretly nibble on chocolate, despite the hives it created. I never loved chocolate, but I wanted chocolate. It was years before I appreciated strawberry ice cream and baked goods in their own right, and not as an unwanted consolation prize. When I grew out of my chocolate allergy, I grew into my love of strawberry desserts! Strawberry Lemonade Bars are an easy dessert to love. No mixer is needed. These bars come together quickly with only a spoon and two bowls. The individually flavored layers are each packed with fruitiness. Using desert safe ingredients (making these treats perfect for warm weather care packages or picnic baskets), Strawberry Lemonade Bars bake up with a crunchy top crust that gives way to the soft-chewiness below. Rising temperatures require special consideration when baking for care packages. Things melt. Things spoil. The longer a shipment travels, the more attention is necessary. This is my third year sending military care packages into the desert. I have received feedback from “my” soldiers. I have also consulted people with decades of experience sending care packages to the military. Opinions vary as to whether it is necessary to use desert-safe ingredients during the summer months. I personally made the decision to use caution. There are parts of Afghanistan where the temperature can reach 120 degrees in the summer. The interior of military mail trucks can reach 150 degrees! Strawberry Lemonade Bars, and all other Monday Box recipes listed as desert safe, are made with the fat least likely to go rancid in high temperatures (Crisco vegetable shortening) and the sugar least likely to promote mold ( white sugar). “Least likely” doesn’t mean foolproof, but I it does mean that a desert bound cookie has a better chance of arriving edible when adhering to these precautions. 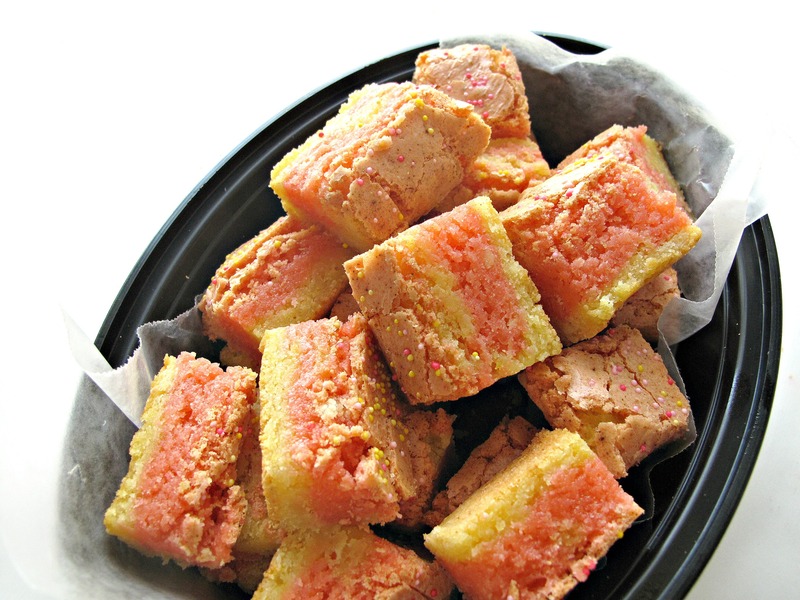 Strawberry Lemonade Bars will usher in the delights of spring time where ever you eat them. Pack a picnic, mail a care package, or just grab one and enjoy! Preheat oven to 350° F. Line a 9” x 9” pan with foil extending over the edges. Spray the foil lightly with non-stick spray. Place vegetable shortening in a large microwave safe bowl and microwave about 1 minute until melted. Into the bowl of melted shortening mix in the sugar. Add the eggs, yolks, and vanilla. Mix with a large spoon until smooth. Gradually stir in the flour mixture until combined. Remove 2 cups of batter and place into the medium bowl. Stir in the strawberry flavor, jello powder, and a few drops of food coloring (until pink). To the remaining batter in the large bowl, add the lemon zest and juice and stir to combine. Spread the lemon batter evenly into the prepared pan. Pour the strawberry batter over the lemon batter, then use a rubber spatula to gently spread evenly over the lemon batter without disturbing the lemon layer. Sprinkle nonpareils generously over the batter. Bake for 30-35 minutes until golden brown and a toothpick inserted in center comes out clean. Cut into bars. For longer shipping times, wrapping the entire pan of lemon bars without cutting will preserve moisture and keep the bars chewy for longer. Store at room temperature in an airtight container or ziplock bag for 2** weeks. Double wrap bars individually or in pairs in plastic wrap before placing in airtight containers or ziplock bags. For longer shipping times, I recommend not cutting into individual bars, but wrapping the entire square first in foil to keep the bars from drying out, then in plastic wrap for an airtight seal. Include a plastic knife in the care package. I love the way you research to make sure that your delights will arrive in prime condition Wendy. These sound just amazing. I love the combination of strawberries and lemon! Thanks, Chris! I can’t be sure, but I make every effort to deliver smiles and not botulism. 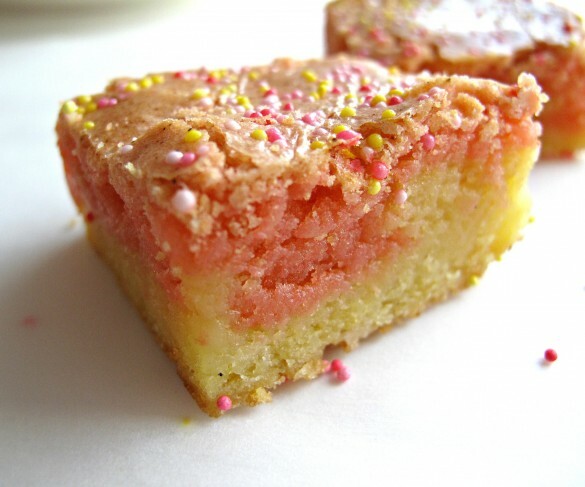 😉 I love the strawberry-lemon combo too…sweet plus tart! Where do you get the strawberry flavoring? p.s. I sent these off this week in my military care package! I’ve always loved strawberry but lemon is a flavor that I’ve only recently come to appreciate in sweet treats! These bars sound fantastic Wendy! And definitely so perfect for spring and summer! Thanks, Ashley! This combo is a favorite of mine, though anything creamy or chewy lemon is a favorite of mine! Isn’t it funny how some tastes stay the same and others change over time! Oooh I love strawberry lemonade, I would LOVE these! Thanks, Jessica! I’m a strawberry lemonade lover too. 🙂 These bars are as tasty as they are pretty! Hi Wendy! These are so pretty and look absolutely delicious, with some of my favorite flavors! Popping over from Oh My Heartsie Girl and pinning. Enjoy your weekend! Thanks, Cindy! Strawberry lemonade makes me think “summer”! I hope you have a great weekend, too! 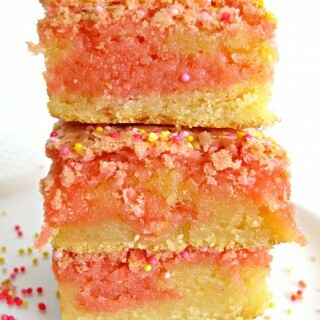 We will love the Strawberry Lemonade Bars they look delicious! Thanks so much for sharing them with us at Full Plate Thursday and come back soon! Thanks, Miz Helen! We love Strawberry Lemonade Bars too and these bars have the bonus of being great travelers (in care packages or to picnics)! What fun fun bars! Thanks for sharing with us on Throwback Thursday! Strawberries and lemons are one of my all time favorite flavor combos. These look lovely! Congrats on the feature at Throwback Thursday, pinned! Thanks, Carlee! I love the strawberry-lemon combo too! Sweet and sour and so refreshing! Thanks for the feature at Throwback Thursday and for pinning! OMG – these bars look soooooooooooo GOOD !! Strawberry and lemonade sound wonderful together. 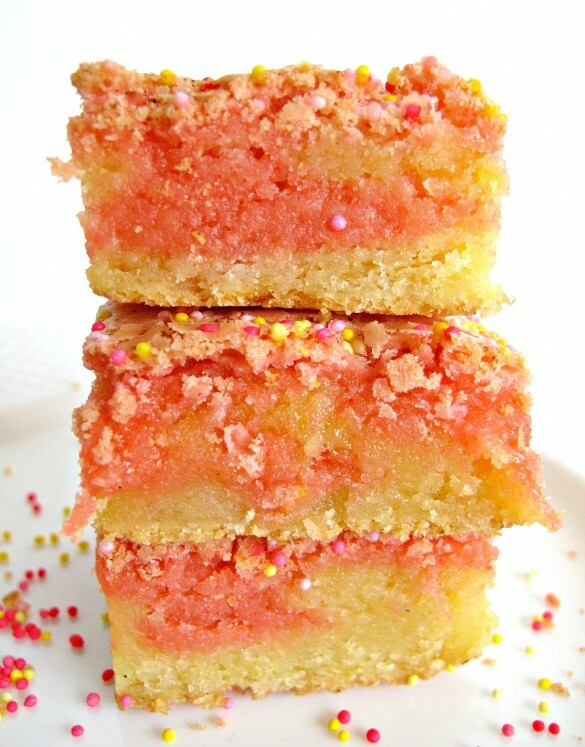 Oh my, I can almost taste these delicious Strawberry Lemonade Bars! Thanks so much for sharing with us at Full Plate Thursday and have a great weekend! Thanks, Miz Helen! 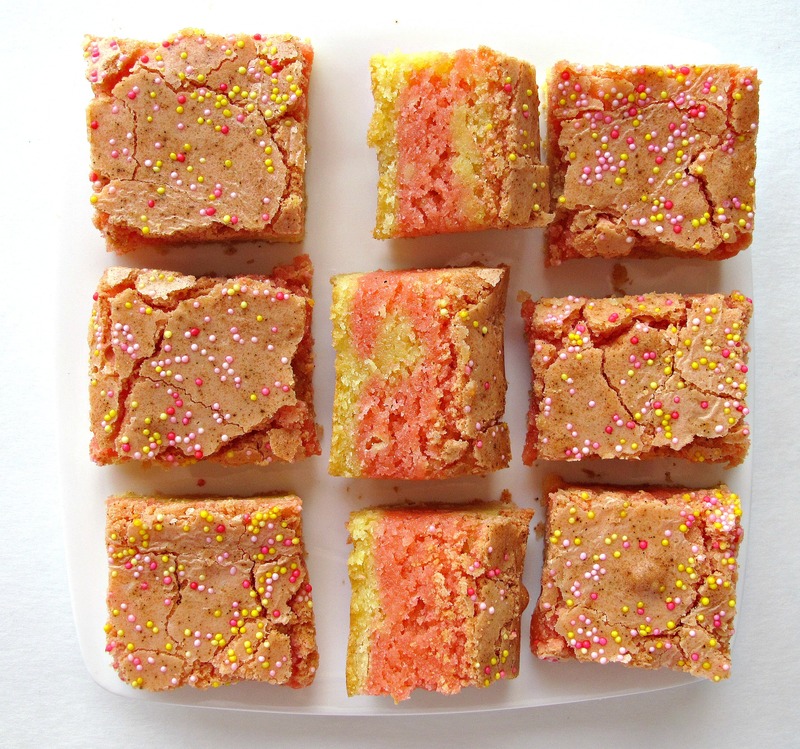 I thought plain lemon bars were my favorite until I tried these Strawberry Lemonade bars! Thank you for hosting Full Plate Thursday! 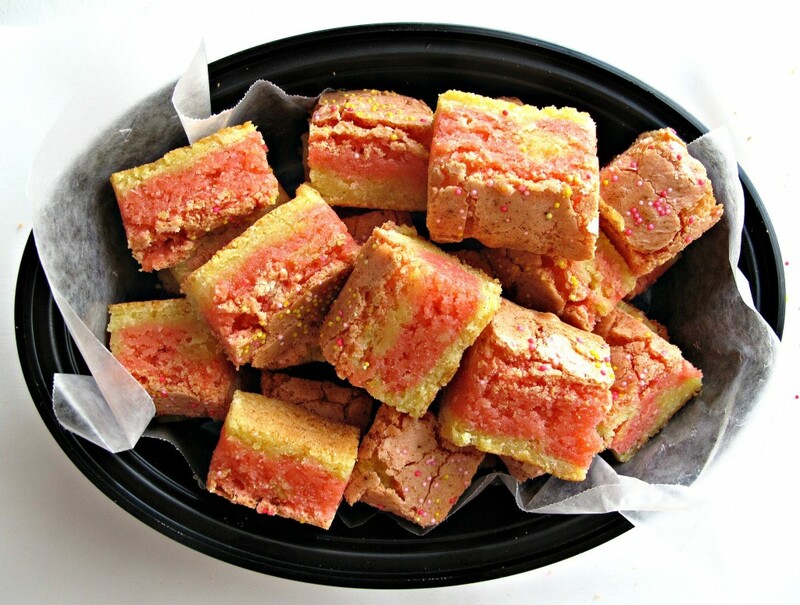 Thanks for hosting the Friday Favorites link party and thank you for featuring my Strawberry Lemonade Bars! Oh my gosh! These look so delicious. I can’t wait to try them!